I'm always on the hunt for unusual accessories, so the moment I discovered this unique coconut bangle, I knew it would make a fantastic addition to my summer wardrobe. I mean, it's made out of a real coconut... how stinking cool is that? I'm all about drinking coconut water, rubbing on coconut butter, and sipping fruity drinks out of coconuts, but the idea of slipping one on my arm and accessorizing with it, was certainly a pleasant discovery. The bracelet is available from Soothi, which is a socially conscious, online retailer that specializes in eco-friendly goods. Their casual and affordable jewelry easily complements your everyday style and I love the fact that it's made from natural, organic, or recycled materials. You can find out more about Soothi's amazing products here! You always look so stylish! Great casual outfit! I like your blouse and bracelet a lot! I love it! It's so quirly, and it goes perfectly with your neutral coloured outfit. Loving the shoes, btw! I can't get enough of this look. The skinny leg pant and flowy top is paired perfectly. Looking gorgeous! And those shoes..amaze! This look is amazing. A perfect summer look! I love this look! And that background is seriously gorgeous! http://youtube.com/thetrendkeeper <<I'm doing a giveaway! This is a gorgeous look! I love the white skinny jeans! Honestly that bracelet is awesome! Very cute! Love your shoes! Love this look - a perfect combination for the onset of autumn! And how cool is that coconut bangle?! Adore this look! Cool shoes from Target and cute bangle, nicely styled. This colour combo looks amazing on you. Have to try this combination. I'm so happy that you found my blog! I am always looking for new bloggers to follow. This outfit is great. I love unusual jewelry, and that coconut bracelet is very cool! The fact that they are an eco friendly business is a double plus! 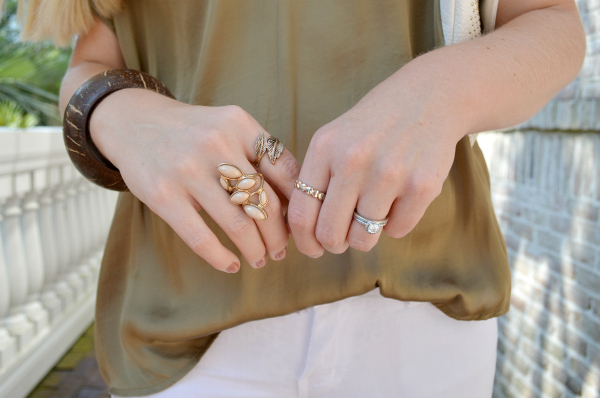 Such a cute outfit, and what a cool bangle! Thanks for the comment on my blog! I love your outfit, that bracelet is so pretty and those heels are fabulous! Love this effortless summer look! Such a cute summer look! I love how the accessories and white pants give it a tropical feel. oh my goodness, thank you so much. I haven't seen the issue yet, but I'm dying. :) And Lauren is the greatest "boss" ever. Love how effortless and chic this look is! I love this coconut bracelet! It's so fun and I love the shoes that match with it. That bracelet is really pretty. I like that it is a natural product of our earth. Your coconut bracelet is such amazing piece! Love your entire outfit as well! love your styling! that coconut bangle really does have that one-of-a-kind feel! I love any company that is socially conscious. thanks for sharing! LOVE this bracelet and your heels. You look stunning. Love the olive green top!! You styled it well! 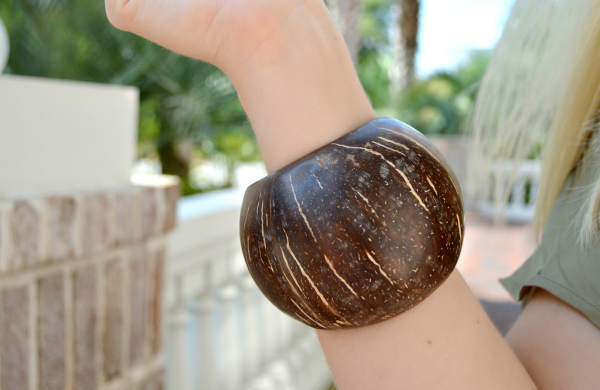 Wow, the coconut bangle is just too cool, looks so similar to a real one. Such a resort chic outfit. Fab heels!! That coconut bracelet is darling. I love anything with a great pair of white skinny jeans. Girl, this is soooo cute. I've never heard of this company before but I love that the pieces are made from recycled pieces. One of my favorite color combinations!! I love the olive color of the top!! I absolutely love this outfit it is so fresh and exotic, it is very "Michael Kors" haha, I feel like it would be something from one of their campaigns ! I'm so glad I found your blog..I love it! And it's so cool that you work for the Lauren Conrad team!! This outfit is so perfect for the summer..I love the white jeans! And your accessories go so well together! I absolutely love this look! So simple, but so stylish. Side note: I actually have those shoes, but I have such a hard time walking in them :( any tips? Cute shoes and jeans. Always love a neutral outfit. You look so chic and fresh! I love the crisp white pants and muted green-beige top. And I am in TOTAL AGREEMENT about that bangle!!! Seriously can't believe those heels are from Target!!! Love coconut as well, that bracelet is such a statement but still casual! The background is perfect for this look! I'm a huge fan of coconut as well. I feel like I just can't get enough!! The bracelet is so pretty and I've never seen anything like it before. It works so well with the colors of your outfit. Beautiful job! 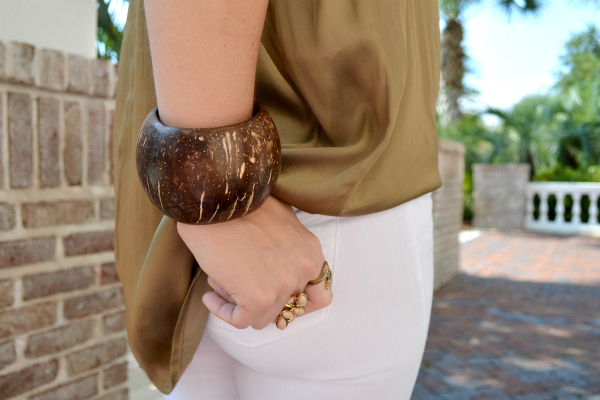 I love this coconut bangle and you styled it perfectly with these heels. Such a flattering look on you! I absolutely love your shoes! This outfit looks so comfortable! I love the color of your top and that bangle is great. Very pretty outfit. Loving the bracelet. Love the olive green, such a beautiful color on you!